CRM software has always incorporated promising technological developments to produce better, smarter platforms. CRM came from humble beginnings: its roots were in on-premise mainframes for digital storage of analog files. In the early 80s, database marketing emerged to consolidate transactional, analytical, and customer data platforms for marketers to reach out to prospects directly. The late 80s brought us the first contact management software, and booming development in the 90s brought us combined contact, lead, and opportunity management tools and thus CRMs hit their stride. In 1999, one enterprising CRM company took to the cloud, and the rest became history. Except history continues to be written. 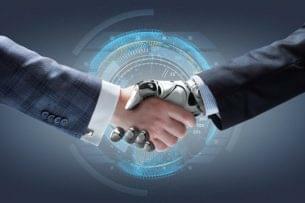 Modern innovations in machine learning, data analytics, computational linguistics, and statistics — the same technologies that provide the foundation for social CRM — are bringing machine learning(not to be confused with artificial intelligence) to business applications. CRM providers are racing to outdo each other to offer machine learning capabilities that promise to apply computer cognition to your business advantage. 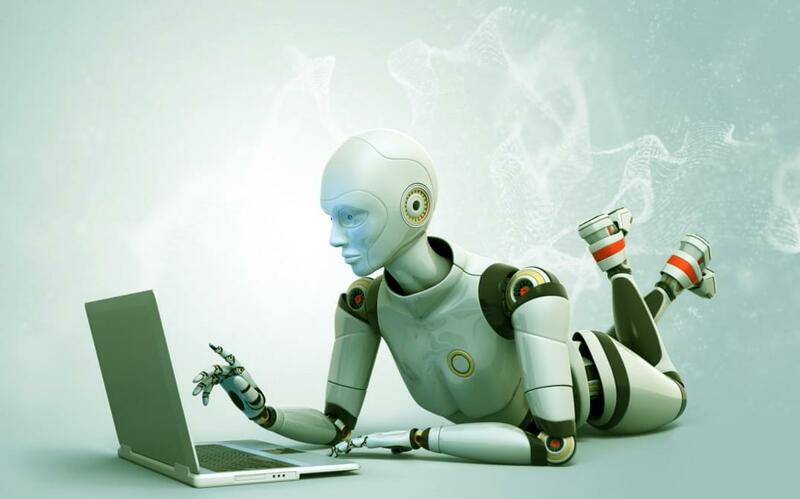 Read on for eight machine learning CRMs raising the bar for sales, marketing, and customer support. 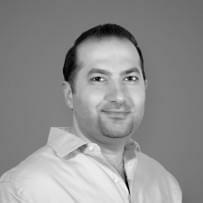 The San Mateo based marketing automation provider — touted as a platform “by marketers, for marketers” — has partnered with Mintigo, a predictive analytics platform founded in 2009. The latter will enhance Marketo’s account-based marketing solution by identifying prospects that have the most buying interest and the individuals within the organization with buying authority. The integration could potentially shorten the time required to qualify high-value leads, better align the marketing and sales teams, and improve personalized prospect engagement. 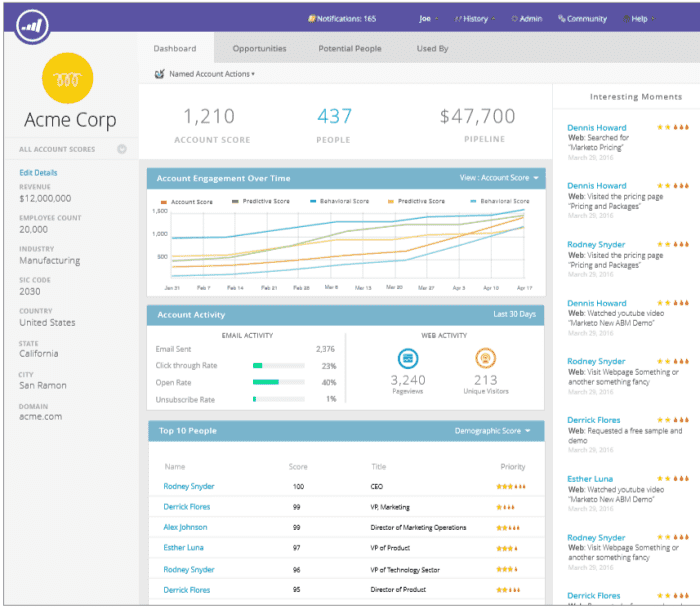 The Mountain View based sales automation mobile CRM threw its hat in the machine learning CRM ring when they launched the Apollo sales science platform last year. Unlike bigger players in the artificial intelligence space, Base’s program is solely focused on sales. Apollo captures and analyzes millions of data points in real-time to offer users a live insight feed and recommendations to increase sales, goal tracking, and forecasting. It also provides a ‘data doctor’, which allows real-time monitoring of the health of CRM data — the percentage of fields completed, and the accuracy of the data. Since its launch, Apollo has acquired over 7,000 customers — which are distinct from customers of the CRM platform — and Base has inked multi-million dollar contracts with companies like Groupon, Cook Medical, and Blue Raven Solar. Last year, Sugar announced plans to introduce two new services: a predictive analytics platform called Sugar Intelligence, and an artificial intelligence assistant named Candace. An initial goal of the features will be to reduce or remove the need for users to modify contact information on their own. Instead, the A.I. would integrate external data points (including from the Internet of Things) with users’ CRM data to update records on its own. Additionally, the assistant would be able to recommend specific interactions with customers, help users plan meetings, build deeper connections, and respond to real-time developments as required. Candace would use natural language processing to parse conversations and plan follow-up actions while Sugar Intelligence will be an open platform so developers can add their own features. 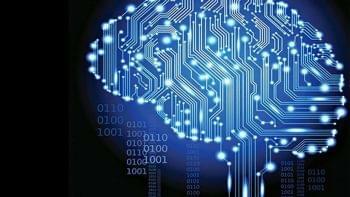 The new machine learning features are slated to be rolled out this year. 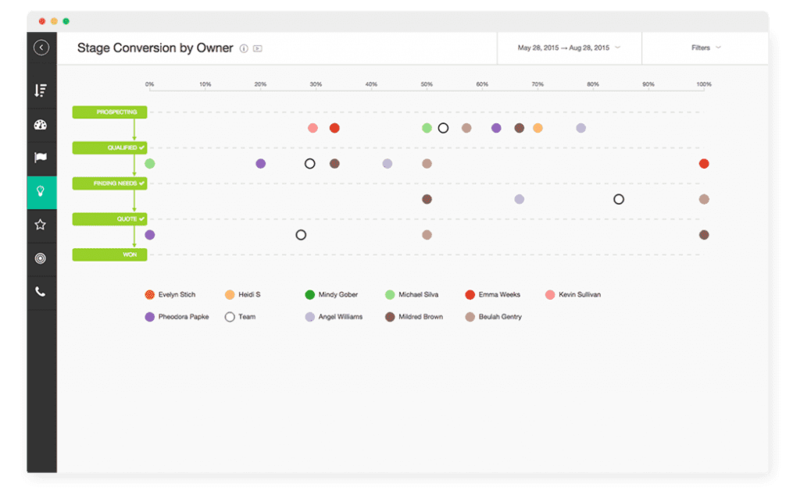 Not to be left behind, Zoho recently unveiled its own machine learning CRM feature — an artificial intelligence powered sales assistant named Zia. Zia aims to detect anomalies in sales operations to predict whether teams will be able to meet their goals well before traditional benchmarks. Zia will be able to predict optimal times for salespeople to reach out to prospects by phone or email, as well as progressively learn individual users’ CRM activities, recommend workflows or macros to automate them, and then set them up for you. In other words, Zia allows your sales automation CRM to automate itself. Zia is included in the Zoho CRM Enterprise plan. Friendly neighborhood helpdesk, Zendesk, offers not one but two machine learning capabilities. 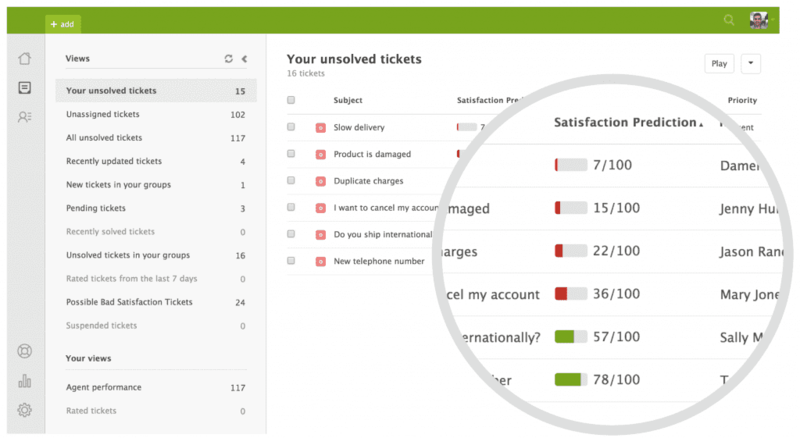 Last year, Zendesk announced Satisfaction Prediction and an open beta for Automatic Answers. Satisfaction Prediction applies predictive analytics to predict the likelihood of particular tickets ending with a good or bad satisfaction rating. It incorporates hundreds of signals — such as text description, number of replies, and total wait time — to dynamically calculate satisfaction. This allows agents to prioritize tickets accordingly to produce more positive outcomes and reduce churn. It also provides dashboard analytics. Automatic Answers adds artificial intelligence to customer self-service: to reduce ticket volume, the program interprets customer questions and directs them to the most relevant knowledge base articles. 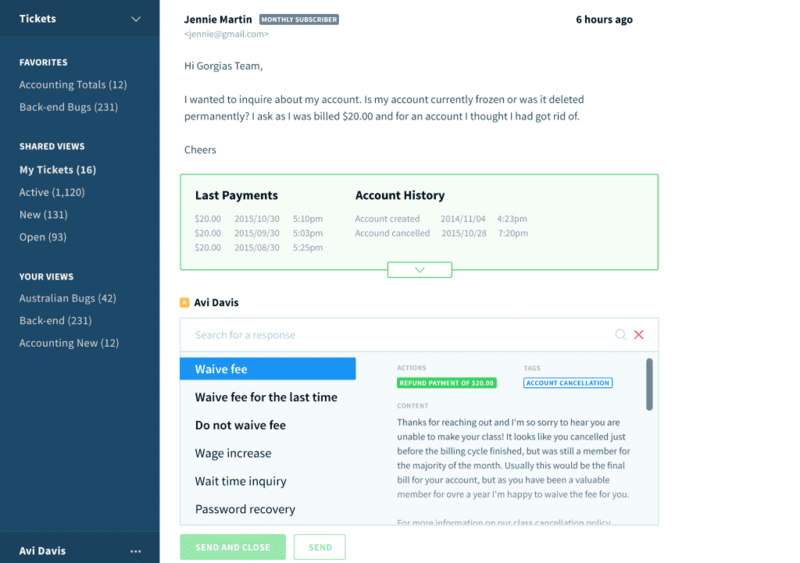 The open beta announcement introduced a number of changes that include: a deep learning model for use by any Zendesk account, a fully-integrated end user experience, greater configurability, and deflection reporting to understand how many users are finding their own answers on account of the service. Gorgias (pronounced like “gorgeous”) is a helpdesk that aims to unify communication with customers across channels — including social network messengers — while contextualizing each customer by drawing upon a variety of external apps. Gorgias allows users to create macros that apply to integrated third-party tools and build workflows that prioritize certain customers to kinds of issues. Gorgias is small, but they’re growing — their artificial intelligence capability shows they’re ambitious, as well. Gorgias applies machine learning and semantic analysis to analyze tickets and recommend canned responses, or automatically tag incoming tickets, which can be dealt with in bulk actions. Gorgias currently serves ecommerce websites and on-demand startups specifically, but they’ve got an eye for growth: they’re looking to integrate with additional messenger apps as support channels as well as third-party analytics tools. Microsoft has invested a lot in its machine learning capabilities. It offers its Azure Machine Learning Studio for designers to build, test, and deploy predictive analytics models. But it’s the Cortana Intelligence Suite ( redubbed from last year’s ‘Cortana Analytics Suite’) that augments Dynamics 365 through Microsoft Flow to provide translation, sentiment analysis, and keyword identification. These features benefit all aspects of CRM, from sales outreach to social customer service to SEO analysis. Microsoft provides tailored solutions depending on company size, industry, and needs. Between Azure, Cortana, and Power BI, the Redmond giant invests not only in its own formidable machine learning capabilities, but also backs startups specializing in AI. The elephant in the CRM room, Salesforce was the upstart that took to the cloud in 1999 and redefined not only CRM, but software distribution as a subscription model. Salesforce by far is the market leader in the CRM space, and they’ve known which way the wind is blowing. Their artificial intelligence platform, Einstein, learns from users’ data and can predict outcomes, prescribe solutions, and automate tasks. Salesforce offers solutions according to company size, industry, and need. Further, an Einstein iteration exists for each one: there’s an Einstein for the Service Cloud, Sales Cloud, Marketing Cloud, Commerce Cloud, App Cloud, Financial Services Cloud… the (exhaustive) list goes on. 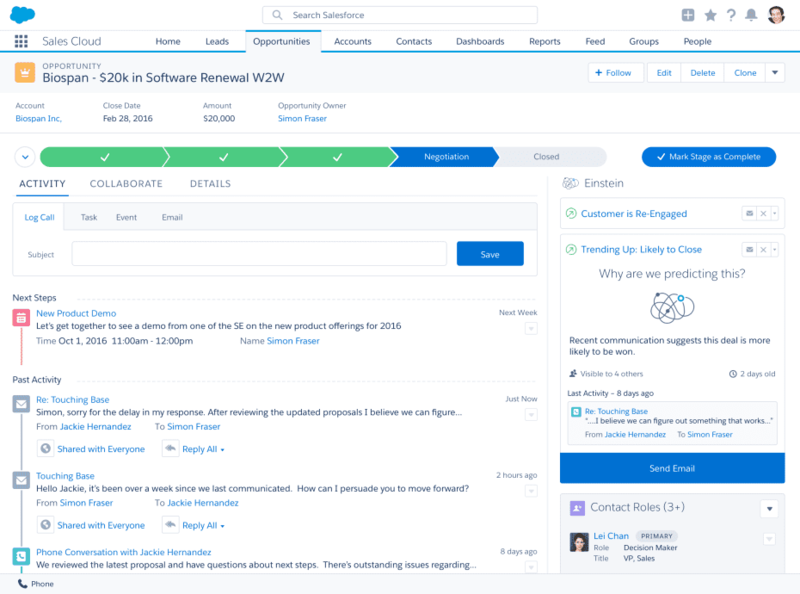 Salesforce recently added features to its Einstein Sales Cloud for high velocity sales: the capability of generating predictive lead scoring, previously accomplished by using data from integrated partners, will now be built-in. In the same update, the Einstein High Velocity Sales Cloud will now automatically capture interactions between users and customers through linked email and calendar accounts. Suffice to say, the CRM behemoth keeps its fingers in many pots, but it always keeps those pots stirring. Developments in innovative technologies have always influenced our business applications. CRM providers are faced with an age-old conundrum: invest in uncertain capabilities, potentially at the expense of a more refined existing platform, or risk missing out on the functionality that might come to define the space. These providers have placed their bets — bets that might pay off for companies and customers alike quicker than we think. 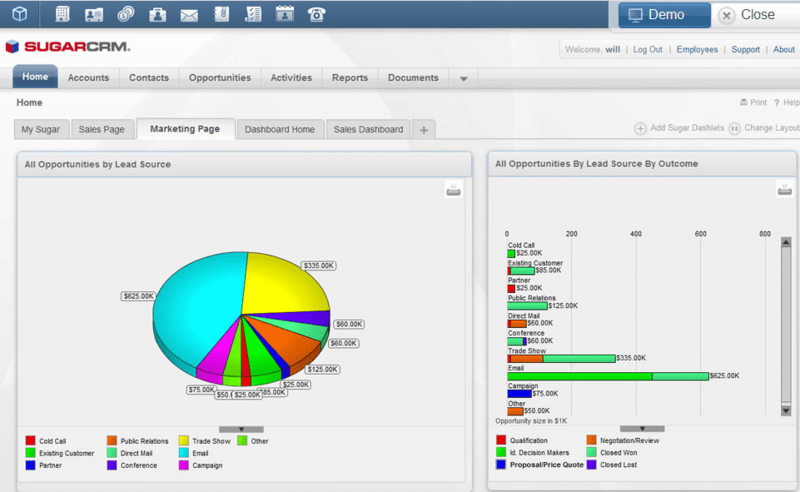 Looking for a CRM? Check out our free comparison guides for sales automation, marketing automation and helpdesks.